Singing or dancing under a warm and cozy shower is an urge than many of us find hard to suppress. What more luxury could you demand if you have your favorite numbers playing out while the warm water flowing over caresses your body at the start or end of a day. A shower head speaker only enriches the experience of bathing comfort. Humming alongside your treasured tunes playing out in the bathroom is a great way to start a day. In the privacy of the space, all inhibitions are let loose. Be it a song on the radio or a lowdown of the latest news bulletin, a showered head speaker keeps you engaged, connected and updated even in the most private moments. Basics: What exactly is a Shower Head Speaker? It’s just like a standard shower head with one major addition – a Bluetooth speaker. This small speaker can add rhythm to your shower experience. You can tune in to your favorite radio station, play your favorite tracks or keep abreast of the latest developments in your area by tuning in to a news channel. And no, it isn’t like that detachable, waterproof Bluetooth speaker you can move inside the house for music or radio playback on the go (they are great too). They cannot be mounted on top of showerheads and they are not designed for showers. 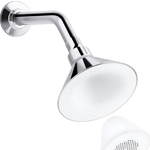 A shower head speaker has a Bluetooth speaker placed within a small compartment inside the showerhead; generally, magnets are used to keep the speaker in a stationary position. A showerhead speaker has one dedicated purpose – to make your daily deluge all the more joyful. 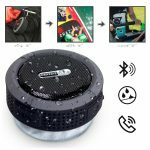 Like any other Bluetooth device, your showerhead speaker can be easily synced (takes few seconds) with a smartphone (Android, iPhone, or anything else), computer, laptop, tablet, etc. So, while the digital processing is handled by your smartphone or laptop, the showerhead speaker will broadcast the voice output for you. Melodic showers. Set the mood right. Gear up for a fun-filled day in the morning. Thoroughly wash off the stress after a tiring day. Reboot yourself with a melodic, revitalized shower. Anytime. Surprise your better half. How about playing your love one’s favorite track in shower on a special day? You know they will love it. Sing your heart out. Who doesn’t love singing in bathroom? Everyone does. Now with a track playing in the background, you can imagine how much better your bathroom singing pastime can get. It gets all the more interesting. Enjoy multitasking? It’s for you! If you are one of those busy bees who snack on the morning news at breakfast, read magazines on your way to office or tune in to your favorite news stations during lunchtime, shower head speakers were probably invented for you. Podcasts, motivational speeches or lectures, local news or anything else that adds value to your life – you’ve got an extra 10-15 minutes for that. Superior sound quality. 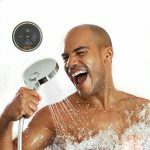 The shower head speaker is positioned right where you need it the most; docked to the showerhead and close to your ears – its music broadcasted straight to your years. Many shower head speakers are portable and they can be moved outside the shower area. This is a great feature for those who want to use the same speaker at different places. Selection: How can I find the best Shower Head Speaker for Myself? Do you like the idea of melodic showers? Take a look at the following checklist. It will help you figure out which shower head speaker best matches your needs. Connectivity options. How can you sync the shower head speaker? Bluetooth is pretty much a universal option. Some advanced showerhead speakers even feature phone calls and voice messages! What do you want, like now? Avoid purchasing a highly expensive showerhead with features that you will not use in foreseeable future. Be practical. Adjustable volume. Being able to raise or lower the volume while in shower is obviously a great plus. Check if the shower head speaker you have fallen in love with at first glance provides quick volume control or not. What if you want to increase the volume for the next track your showerhead speaker begins to stream few minutes after you stepped inside the bathroom? Quality of sound. You don’t just want it be loud; total harmonic distortion should be as low as possible (preferably less than 1%) for best experience. There is a reason why some great speakers from reputed brands cost many times more than average speakers. In most cases, like they say, you get what you pay for. Battery run-time. If you shower for at least 10 minutes a day, a showerhead speaker battery with a run-time of roughly 7 hours would run continuously for around 7 weeks. Do the Maths when you shop. How soon do you want to recharge the batteries? Don’t forget the showerhead. 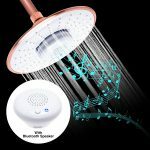 The music is an addition to the shower but you shouldn’t really be forgetting the showerhead. Scan through consumer reviews to find out if the showerhead too is as awesome as the speaker or not. Is it detachable? Can you remove the speaker and user it elsewhere, just in case you wanted to?